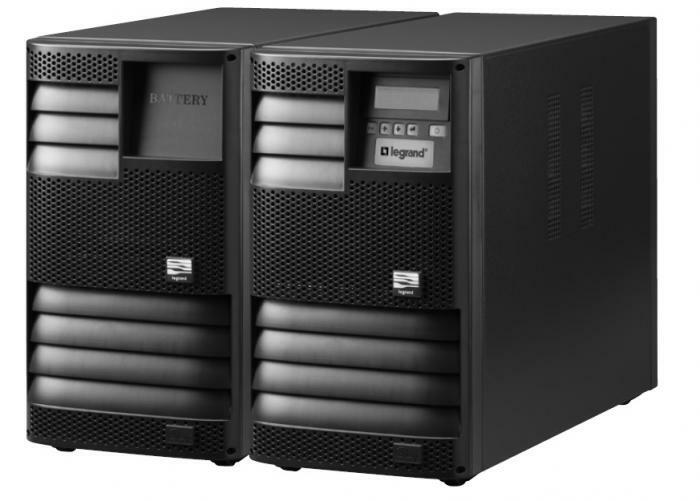 The Legrand UPS MegaLine 8750/2 model is a UPS using high frequency PWM technology, On Line Double Conversion type, solid neutral, modular architecture, with the possibility of N+X redundant configuration, Rated Power 8,750 VA – 6,125 W, equipped with valve-regulated hermetic-type accumulator batteries, contained inside the UPS in a specific compartment or in one or more external cabinets, sized to guarantee a minimum autonomy of 11 minutes when 80% charged. Bypass: Static and Electromechanical, automatic and internally synchronised (due to overload or operating fault). - Electronic protections against overloads, short-circuits and excessive battery discharge. - Operation stops when the back up time ends. In-rush current limiter at start-up. - Sensor to connect the neutral cable correctly.